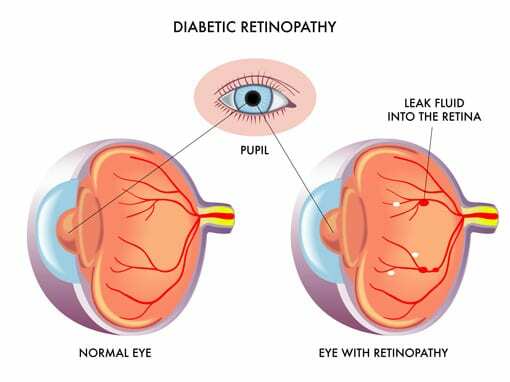 Diabetic retinopathy is a complication of diabetes mellitus, which causes abnormalities in the tiny blood vessels nourishing the retina. Diabetic retinopathy is a leading cause of blindness among adults. Approximately 28% of current of adults with diabetes have retinopathy. Early detection and management of diabetic retinopathy is important to prevent or slow the development of the more sight-damaging stages of the disease. With careful monitoring, treatment of diabetic retinopathy can usually be started before sight is affected. If you have diabetes, an annual comprehensive eye examination is the best protection against the progression of diabetic retinopathy. It is caused by changes in the blood vessels of the retina. In some people with diabetic retinopathy, blood vessels may swell and leak fluid. In other people, abnormal new blood vessels grow on the surface of the retina. The retina is the light-sensitive tissue at the back of the eye. A healthy retina is necessary for good vision. We encourage you to schedule a consultation with Triad Eye Institute today. During our meeting, we will advise on whether or not you have Diabetic Retinopathy, as well as compose a custom treatment plan designed to achieve the clear vision you’ve always wanted. Call our office today and one of our seasoned staff members will be able to assist you.